On his Armani/Dolci website and in his sweets emporiums across the Middle East, Giorgio Armani is offering a box of chocolates, date-and-honey-filled pralines sans alcohol. But his gracious gesture has nothing on that of Monique Lhuillier, who is selling a selection of caftans on the upscale Moda Operandi site, including a version in virginal white embroidered with cascades of field flowers. Nor can it compete with Tommy Hilfiger, whose 11-piece capsule collection, available at Hilfiger stores in the Middle East, incorporates temptations like a cowl-neck black satin evening dress and a long-sleeve teal gown slit, a bit indecorously, from instep to knee. Mr. Hilfiger is among the latest in a handful of designers and merchants seeking to capitalize on the advent of Ramadan, the holiest month of the Islamic lunar calendar. (It ends this year on July 17.) A time of fasting and contemplation alternating in the evenings with festive gatherings of family and friends, it has emerged in recent years as a month of extravagant spending that is rivaled, some say, only by Christmas. 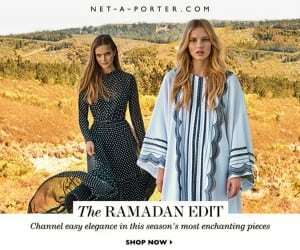 That notion was not lost on Net-a-Porter, which last month heralded the month with the online announcement of a “Ramadan Edit,” featuring two fair-haired models glamorously posed in flowing garments against a backdrop of parched earth. The gambit was a bold one. “It’s the first time we’re talking to Ramadan so directly,” said Holly Russell, the senior ready-to-wear buyer for Net-a-Porter. Thus far feedback on Facebook and other social networking sites has been positive. “We haven’t gauged quite yet the impact that it’s going to have,” she said. One thing is certain: Such appeals to a deep-pocketed segment of the Muslim community have rarely been more pointed or direct. Such efforts are bound to raise eyebrows, he said. But profiling, to some minds, is just another word for canny marketing, the strategic, and progressive, attempt to identify consumers, women in particular, who have traditionally greeted Ramadan in their most lavish finery. Many of them are ready to part with sums estimated to range from $300 to several thousand dollars in a single online or store visit, temporarily setting aside their abayas and burqas for ornately embroidered caftans, colorful gowns, loosefitting dusters and all manner of gilt-edged refinements to wear in the evening and through Eid al-Fitr, the three-day festivities to observe Ramadan’s end. Ms. Russell describes those women as worldly, tech savvy and fashion aware. “They will look at the runway images, and if they see something they want, they will ask for it,” she said. Many are partial to items like an embroidered Oscar de la Renta caftan ($2,890), an amply proportioned bib-front silk Valentino midi-dress ($3,790) or, on the sportier side, a zip-front Stella McCartney stretch-crepe top ($665). A screen shot from Moda Operandi’s site. Others have been more tentative in their marketing efforts. Indeed, even fashion houses like Hilfiger and DKNY, which is offering, for the second consecutive year, a special Ramadan collection, have scarcely dipped a toe in the water, their capsule lines sold strictly in the Middle East. Some may view such cautious efforts as missed opportunities. According to a study released last year by the American Muslim Consumer Consortium, of two billion Muslims worldwide, about nine million are in North America. Sabiha Ansari, a consortium founder, puts Muslim spending power in the United States at $100 billion. Her hope, she said, is that American retailers will recognize Muslims in this country as a strong economic force. That message has dawned haltingly on high-end merchants. Neiman Marcus has yet to court the Muslim shoppers deliberately, but during a promotional calendar meeting at the headquarters last week, “Ramadan came up as an opportunity we need to understand better,” said Ginger Reeder, a spokeswoman for the store. Was it a time for gift-giving, one that includes but is by no means limited to fashion?